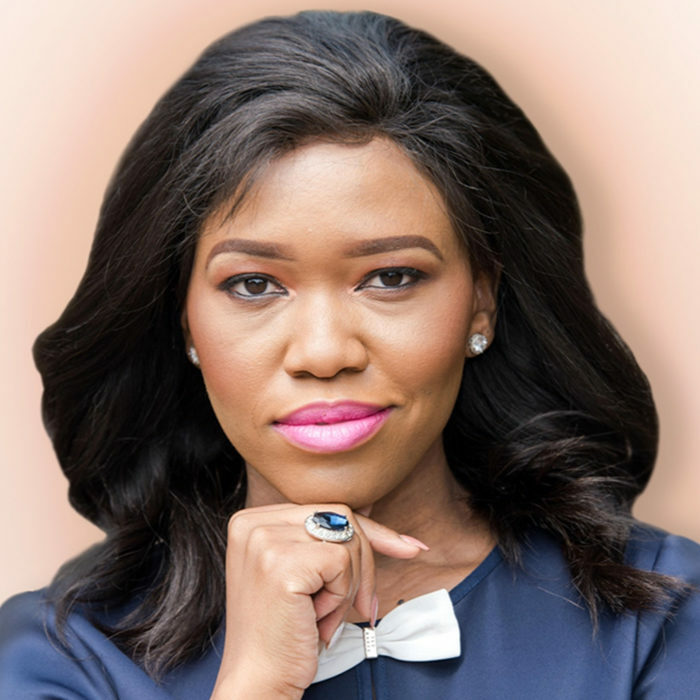 Samke Mhlongo-Ngwenya (previously Samke Ngwenya) is one of South Africa’s most recognizable personal finance experts, youngest board member of State-owned mineral technology research council MINTEK, and founder of The Next Chapter (“TNC”) Wealth Partners. TNC Wealth Partners (www.tncwealth.com coming soon) is a personal finance management company that “partners” with individual clients, Financial Services Providers, and industry experts to fulfill its mission of “ushering in the next chapter in the African financial consumer’s wealth narrative”. Samke executes on this mission through her roles as a personal finance consultant, corporate speaker, thought leader, media commentator, and financial inclusion advocate. Samke offers one-on-one personal finance consultations through her company TNC Wealth. Upon Investec Group CEO Stephen Kosseff’s recommendation, she was recently appointed to Maureen Kark and Associates as a financial wellness consultant, where her consultation services are made available to individuals employed at some of the country’s top blue-chip listed companies. Samke’s unique value proposition comes from the debt management and wealth creation expertise obtained during her 7-year tenure as a private banker at Investec Bank Ltd, something not many financial wellness coaches can boast to have. She also has a network of TNC Wealth preferred registered financial advisors and wealth managers for those individuals requiring specific product or investment advice. discipline of personal finance quickly created a following for her thought leadership on millennial, career management and women’s issues as well. Some of Samke’s previous clients include SASOL, Anglo American, Standard Bank and Accenture. Samke’s most popular talks include “Countdown to Financial Freedom”, “Management in the time of the #hashtag”, and “Thinking of an MBA? You can have mine”. More notably, Samke gave the keynote address at the 2017 Centre for Economic Leadership and Development’s (“CELD”) Woman and Finance Summit with an address titled “Managing Money and Building the African Woman’s Wealth Base”. Referred to by CNBCAfrica as a “personal finance goddess”, Samke is a regular commentator on leading news stations CNBCAfrica, eNCA, Talk Radio 702 and PowerFM; is a finance contributor for DESTINY magazine, and is a financial inclusion champion of The Graca Machel Trust. Armed with an Accounting degree from the University of Cape Town, a Postgraduate Diploma in Management from Wits Business School, and an MBA from the same college completed with a research report titled Factors contributing to over-indebtedness in black South African females, Samke aspires to continue developing content that educates, entertains and empowers her audience. Samke (Sam) Ngwenya is the quintessential millennial who does things her way. She cannot be boxed under one description, which is why she goes by three: Banker, Fairminist and Frugal Kugel. Sam is your most unconventional employee as she has three formal income streams, your most difficult customer as she has access to your global competitors, and your most unpredictable life-partner as she does not subscribe to traditional role descriptions. Samke is a seasoned private banker with over 6 years banking experience. She also serves on the board of directors of MINTEK – a mineral technology research council under the Department of Mineral Resources. In addition, Sam regularly lends her personal finance expertise to television and radio stations such as eNCA, Talk Radio 702 and PowerFM. She also recently ventured into writing with the submission of a financial article appearing in DESTINYconnect. Samke holds an MBA from Wits Business School completed with a research report titled Factors contributing to over-indebtedness in black South African females. She also holds a Postgraduate Diploma in Management from the same college, as well as a Bachelor of Commerce in Financial Accounting from the University of Cape Town. A collection of financial consumer education experiences best-suited for individuals with a basic to intermediary level of financial sophistication. The experiences are tailored to address the unique financial concerns of university students, graduates, and economically active individuals looking to enter into, or successfully manage and discharge existing debt obligations. For graduates: An experience providing career guidance and personal branding advice for those entering the world of work. For employees: An experience on improving your personal brand and influence both within and outside the organization, navigating corporate politics, creating fulfillment in order to improve productivity, and the practicalities of creating multiple income streams whilst in fulltime employment. For management/leadership: An experience inside the mind of the millennial employee. Insights on how to attract, retain, reward and motivate millennials. An inspiring journey through the darkest, seldom-shared moments of a drawn-out, messy divorce through to the achievement of personal, financial and career success. The experience shares lessons on building resilience, practical coping mechanisms in times of distress, and how to engage the law of attraction for success.